In a week during which the government announced the launching of a criminal investigation of the disaster, the Gulf of Mexico oil spill topped the news agenda for the fourth consecutive time, according to the Pew Research Center’s Project for Excellence in Journalism. 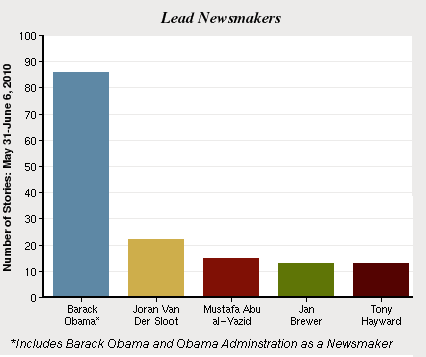 With public anger appearing to mount and President Obama making his third trip to the Gulf region, the story accounted for 35% of the newshole from May 31-June 6. That represents the second-biggest week of coverage (it was 38% from May 24-30) since the April 20 oil rig explosion that triggered the catastrophe. And news late in the week that BP’s containment dome was siphoning off some of the oil was greeted with far more uncertainty, and even skepticism, than celebration. 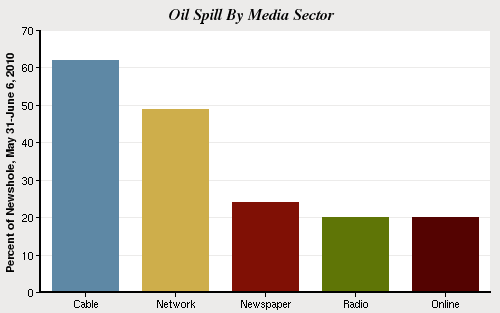 In the seven weeks since the late April explosion, the spill saga has come to overshadow every other subject in the mainstream news agenda, registering at 22% of the newshole for the period. The second-biggest story during those seven weeks, the U.S. economy, stood at 14%. No other subject has registered in double digits in that period. Last week’s No. 2 story was the fallout from Israel’s May 31 interdiction of a flotilla headed for Gaza that resulted in the killing of nine people and triggered a significant international outcry. That episode accounted for 13% of the newshole and marked the most coverage of the Israeli-Palestinian conflict since the Gaza fighting between Israel and Hamas reached 17% of the newshole from January 5-11, 2009. The week’s third-biggest story last week, the economy, has clearly been nudged out of the headlines by the Gulf disaster. From May 31-June 6, the nation’s economy accounted for 6% of the newshole, the same total as the previous week. And this modest level of coverage comes amid another rough week on Wall Street and a disappointing jobs report. Meanwhile, news about the 2010 midterm elections (No. 4 at 5%) finished among the top five stories for the fourth straight week. The key storylines included the primary defeat of Democrat Artur Davis in his bid to become Alabama’s first black governor and word that the White House dangled a job in front of a candidate to avoid a Democratic primary fight in the Colorado Senate race. The fifth-biggest story (3%) was coverage of events related to the Memorial Day commemoration. One other story worth noting was the controversy that erupted after umpire Jim Joyce made an erroneous call that deprived Detroit Tiger pitcher Armando Galarraga of a perfect game on June 2. Although PEJ’s News Coverage Index does not include newspaper sports sections or sports-oriented broadcasts, the story still finished No. 9 for the week at 2% of the newshole. The oil disaster was the top story in four media sectors last week, but as has generally been the case, it once again proved to be particularly a television story. The spill filled 49% of the network news time studied and a whopping 62% of the cable news airtime. Another pattern also continued last week, as the attempted containment, cleanup and impact of the spill was again the dominant storyline but issues such as the culpability of BP and the fallout for the federal government combined to account for a significant subplot, about one-third of the coverage. The week began with news that the so-called “top kill” effort to stop the flow of oil had failed and ended with word of some success with the containment dome plan. The continuing impact of the disaster, both on wildlife and humans, was also highlighted in last week’s coverage. On ABC’s World News Tonight, correspondent Chris Cuomo traveled with the mayor of Jean Lafitte Louisiana as he negotiated with BP for access to more absorbent boom to soak up the oil. In the same newscast, ABC aired video of a fisherman in a hospital bed, complaining of headaches and feeling “nauseated” as a result of contact with the spill. “You have frighteningly similar accounts…of the same type of symptoms,” noted Cuomo, while anchor Diane Sawyer asked Gulf Coast residents with questions and problems to contact the network. “We’ll try to get you some help and some answers,” she vowed. That same day, the administration announced the launching of that investigation. And even if the spill saga did not turn into a full-fledged political finger-pointing story last week, the President’s handling of the situation, and notably his temperament, was part of the narrative. Interviewed by Larry King, Obama said he was “furious” about the spill. But some critics weren’t sure he was showing enough passion. On his Fox News cable show, conservative host Bill O’Reilly said he thought Obama looked “a little cold-blooded… He looks a little like, all right, I’m here—you know, if that pelican is full of oil, Hey, that’s just the way it goes…"
Liberal New York Times columnist Maureen Dowd wrote a June 1 piece that made a similar point, albeit in different terms. The week’s second biggest story, the Mideast flotilla fight, was the top story in one media sector, online, where it registered at 21% of the newshole. Online, international news typically plays a bigger role among the top stories. Much of the commentary included either harsh criticism or a staunch defense of Israel’s actions on board the Turkish ship Mavi Marmara, even as the exact sequence of events remained in dispute. But other analyses took a look at some of the strategic implications of the episode, which triggered significant international protests. A June 3 New York Times story suggested a possible shift in U.S. policy toward the situation in Gaza. The economy finished as the No. 3 story, generating the most coverage (17%) on radio. The big headliner was a government report that the economy added about 430,000 in May, news that produced a wave of pessimism since that was lower than anticipated and was driven by the government’s hiring of temporary census workers. Stocks responded on June 4 by plunging more than 300 points. Coverage of midterm election news was highest in the politically oriented cable news sector (8%). One storyline was the revelation that the administration had mentioned some job opportunities to Colorado Democratic Senate candidate Andrew Romanoff should he abandon a challenge to incumbent Democrat Michael Bennet. This follows on the heels of a similar offer made to Pennsylvania Democratic Senate hopeful Joe Sestak, who challenged, and beat, incumbent Arlen Specter in that primary. Finally, news about Memorial Day remembrances, which finished as the fifth-biggest story at 3%, included the downpour that curtailed Obama’s originally planned speech that day at the Abraham Lincoln National Cemetery in Illinois. The No. 2 newsmaker (2%) was Joran Van der Sloot, the 22-year-old Dutch man arrested in connection with the murder of a young woman in Peru. For American news audiences, he is better known as the chief suspect, although never charged, in the case of Natalee Holloway, the young Alabama woman who disappeared in Aruba in 2005 while on a high school graduation trip. He was followed, also at 1%, by Mustafa Abu al-Yazid, a top-ranking al-Qaeda official whose death by a U.S. drone strike in Pakistan was announced last week. The next two newsmakers, also at 1%, were Arizona Governor Jan Brewer and BP boss Tony Hayward. Brewer made headlines last week by meeting with Obama about Arizona’s controversial new immigration law, which she supports and the President does not. Hayward apologized last week after his earlier remark that “I’d like my life back” was greeted with significant criticism.